The conference tournaments concluded last weekend with a fairly predictable selection process. 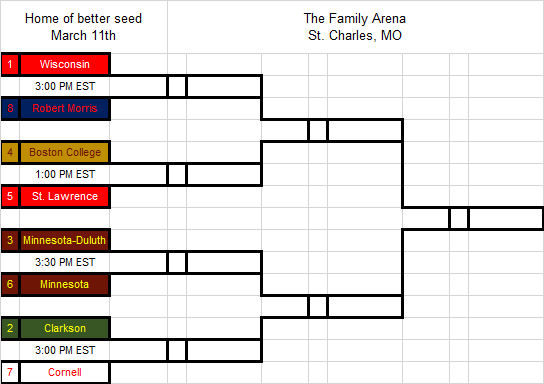 The only real question was whether the committee would extra, super penny-pinch and have Clarkson and St. Lawrence play one another, but it didn’t come to pass. What we are left with is perfect bracket integrity. In fact, not only is the bracket perfect, but Robert Morris, the CHA champion, is also the eighth-ranked team in the PairWise. The system works! Wisconsin went wire to wire as the best team in college hockey. Based on relatively few senior losses compared to in-conference rival Minnesota, most had pegged them as the top team heading into the season. They did nothing to dispel that notion as they compiled the best record (31-2-4), most goals (149), fewest goals allowed (32), most shots (1,525), fewest shots allowed (694), best team save percentage (.955), and the fourth-ranked power play and top penalty kill to boot. They won their conference tournament in fairly convincing fashion, their closest game a 2-1 win over North Dakota in the semifinals. They haven’t lost a game (not counting shootouts) since December 3rd, 2016, a 17-0-3 run. Robert Morris, meanwhile emerged early on as the top team in the CHA and, like Wisconsin, held that crown all season. Unlike the Badgers, the Colonials didn’t statistically dominate their opponents in nearly every fashion. The Colonials compiled an impressive 24-4-6 record and +39 goal differential, but played the third-weakest schedule in the nation. In their lone game against a ranked team, the Colonials managed a tie with Clarkson that turned into a shootout loss in the Windjammer Classic tournament. Robert Morris finished the season with five straight victories and allowed just two goals in that span. The Badgers and Colonials didn’t play each other but they did have three common opponents. To say that Wisconsin has the edge and are heavy favorites would be an understatement, but the Badgers would also be foolish to take Robert Morris lightly. This is a team everyone has been expecting to fall back to earth for weeks, and while they did lose a couple second-half games, they’ve largely taken care of business. 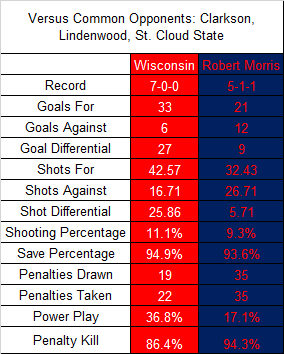 There is really nothing here to suggest that Robert Morris can beat Wisconsin, but if they are to do it, it will begin and end with getting pucks past Desbiens. You have to score to win in this league, and every other league I am aware of, and not many teams score against the Badgers. Wisconsin has given up two goals in their last six home games. The Golden Knights also largely went wire to wire in winning the ECAC, having lost just one conference game all season. Unfortunately that game was to these Cornell Big Red. That 2-1 decision on January 20th was actually Clarkson’s last loss as they’ve gone 13-0-1 in that span, including a 5-4 overtime thriller in the regular season finale and a 1-0 win to clinch the conference title over these same Big Red. Last season the Knights were a defensive stalwart that also scored a lot of goals. This season they’re an offensive powerhouse that also plays good defense. The slight shift in philosophy has allowed them to bulldoze most of their opponents. Clarkson held opponents scoreless just five times this season, but they scored four or more goals 19 times. Clarkson finished the season playing some of their best hockey, whomping a very good Princeton team 4-0 in the ECAC semifinals and shutting Cornell out in the championship. Cornell started the season well off anyone’s radar with a pedestrian 6-4-1 start but they rode a 14-4-4 finish all the way to the ECAC championship. The Big Red make their success by playing defense and getting solid performances out of six-foot goaltender Paula Voorheis. They upset a very good St. Lawrence team before losing to Clarkson in the ECAC championship. They were the last team to make the NCAA tournament, needing Boston College to beat Northeastern in the WHEA championship to clinch a spot. Clarkson and Cornell met three times during the season, twice in conference play, and once in the ECAC tournament. Clarkson got the better of the series with two wins. Both teams spread the wealth as 23 total skaters (11 for Clarkson and 12 for Cornell) tallied points in the series. Clarkson was led by Patty Kazmaier finalist Cayley Mercer’s 2g and 2a while Cornell had a four-way tie between Hannah Bunton, Lenka Serdar, Sarah Knee, and Jaime Bourbonnais. The key for both teams will be staying out of the penalty box. Seven of the series’ 13 goals were scored on the power play, three for Clarkson and four for Cornell though Cornell might not necessarily mind. A disjointed game where both teams have to play shorthanded favors their defense-oriented style. Clarkson seemed to struggle at even strength amid the penalties they took in the conference final and only looked dangerous in spurts. Cornell, for all their acumen playing defense, looked even less dangerous notching a handful of chances at best. The Bulldogs established themselves almost immediately, ripping Boston College 5-2 in the second game of the season. Duluth never really blew out opponents the way Wisconsin and Minnesota tend to. They scored more than five goals eight times to Minnesota’s 11 and Wisconsin’s 16, but they were able to grind out wins all season long. Their puzzling loss to Minnesota State and their 1-3 record in shootouts kept them from taking the number two spot in the conference away from Minnesota. The Gophers frequently found themselves having to pile up goals to make up for the drop in goaltending with Amanda Leveille’s departure last season. They had some hiccups of their own, an early loss to Bemidji State, back to back shootout wins against North Dakota, and an overtime loss to Boston University that saw them yield six goals on 22 shots. Those games sunk them in the Pairwise even though this is a pretty even matchup. This is about as close as a series can get. The home team was 4-0-1, there were three overtimes, and four of the five games were decided by a single goal. (No empty netter in game number four.) Minnesota’s Kelly Pannek was the nation’s points leader, and is a great player in her own right, but when strength met strength between these two, UMD’s Lara Stalder was the clear victor. Stalder notched 6g and 5a in the series. She had points in all five games and goals in four of them, including the game-winner in the WCHA tournament matchup. Pannek had no points in that game. Ashleigh Brykaliuk and Katherine McGovern each tallied five points (both 2g, 3a)in the series for the Bulldogs, while the Gophers’ Sarah Potomak was the team leader with eight (5g, 3a) with Pannek right behind with seven (3g, 4a). Minnesota feels like they might be a touch deeper, but the teams are actually pretty even. Both had six players over 20 points and the Bulldogs have more in double digits (12) than the Gophers (10). A key difference is Gophers defenders Lee Stecklein, Megan Wolfe, and Sydney Baldwin sit fifth, sixth, and seventh on the team in scoring whereas Duluth blueliners Sidney Morin is fourth and Catherine Daoust is ninth with the rest of their defenders making up the bottom of the scoring table. The Eagles had arguably the rockiest season of any team on this list. They left the first weekend series of the year winless and always seemed on the cusp of falling apart, though they finished first in Hockey East rather easily. Their run through the WHEA tournament needed a 1-0 win over Merrimack in the first round and overtime wins over Vermont and Northeastern, but still, they emerged with that title. Defender Tori Ann Miano was dismissed for the season for reasons that still remain unclear. She had three goals and 11 assists in 14 games and most certainly would have helped. Point per game defenders are incredibly rare. But it’s difficult to pinpoint the exact reason for BC’s woes. There wasn’t much common ground in their losses, they just showed up and played poorly sometimes. St. Lawrence also turned some heads in their first series, though for opposite reasons. They pasted Northeastern 5-0 before winning a chaotic 6-5 game the following day. The Saints started the season 15-0-1 with the draw coming to rival Clarkson. They ended the season 12-5-3, which isn’t exactly bad, but it brought them far enough down to earth that they’ll now have to travel to play BC. Like BC, there wasn’t much rhyme or reason to the Saints’ decline. It looks as if they simply got bounces in the first half of the season that they didn’t in the second. 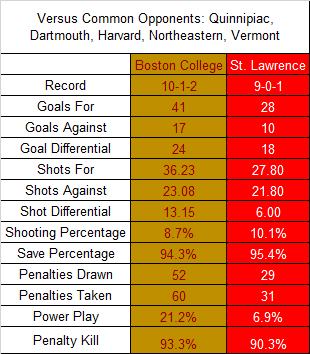 St. Lawrence and Boston College also didn’t play one another during the regular season, but they also had several common opponents. The Eagles were a little more successful on offense, the Saints on defense, but otherwise the teams are very even. Boston College sports more depth with Andie Anastos (15-25-40), Megan Keller (9-29-38), Makenna Newkirk (14-23-37), Delaney Belinskas (16-16-32), and Caitrin Lonergan )15-17-32) all above thirty points. The Saints meanwhile have a more prolific top line. Brooke Webster (23-34-57) and Kennedy Marchment (20-36-56) both cracked 50 points and Hannah Miller was just behind (15-33-48). After that it’s a steep drop to Justine Reyes’ 23 (13-10-23). This game will likely consist of St. Lawrence trying to throw their top line onto the ice as much as possible while Boston College looks for favorable matchups. At some point the Eagles’ top six is going to be skating across from a less prolific set of scorers. It is then that Boston College needs to do their damage.